I was thinking of fabrication some carpeted, padded boxes that fit next to the engine cover in my DD that would contain the sacs, allow people to walk on them or sit on them to avoid the stumbling around when we have a boat load. Has anybody made something like this for their DD? It's not on the side, but a custom base for the rear seat. So how much ballast do you add? We usually add 2-550's next to the engine, and a 360 in the locker ('95 has the small locker). That box all by itself only adds about 300 lbs. We also replaced the stock bag in the center MLS with the Fluid Concept 1k pounder & we estimate that between that & the rear box shown, we netted a gain of 5-600 lbs over stock (runs out at about 1000 lbs of total ballast). 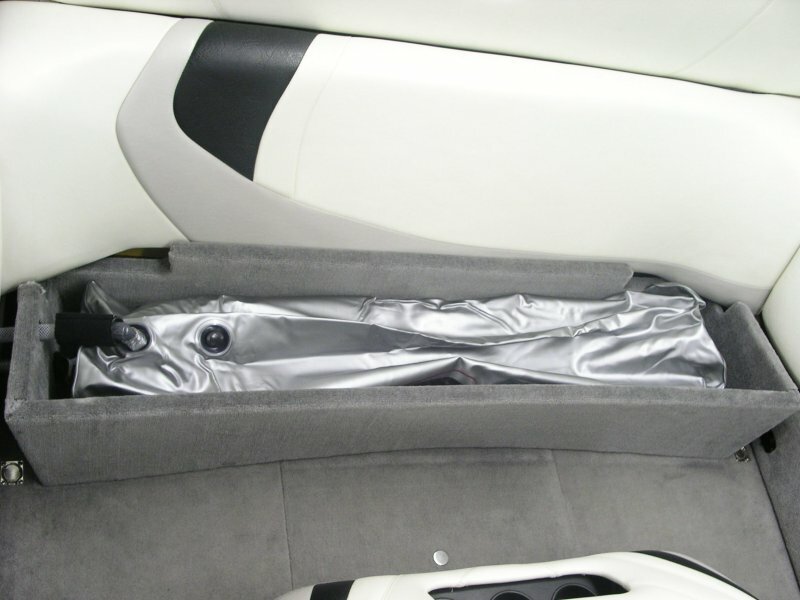 We kept the stock sack & intend to use it right in front of the rear seat (between the rear seat & engine cover on the floor) for when we really want to crank it up, or kind of draped up over the rear trunk on one side for surfing. That would give us a total of about 1500 lbs. Depending on how the surfing wake works out I may get another sack to lay on the floor on that side as well, we'll see. I've thought about something similar. More of a short bridge where you can step on it so you don't sink on the bag when walking over. It wouldn't cover the entire bag. I need to experiment with positioning of the fat sac's in the rear of the boat. With a light load of people, we usually put the 550's on the floor and on the rear seat together and then the locker sac up front. With a heavy load of people, we put the 550's on the sides of the engine cover. I thought of using some treated 2x8's or 2x10"s and frame in the side sac's, carpet all and pad the top to sit on if necessary. I also thought of having the carpet run under the sac's from the sides to help keep it all in place when the water moves. 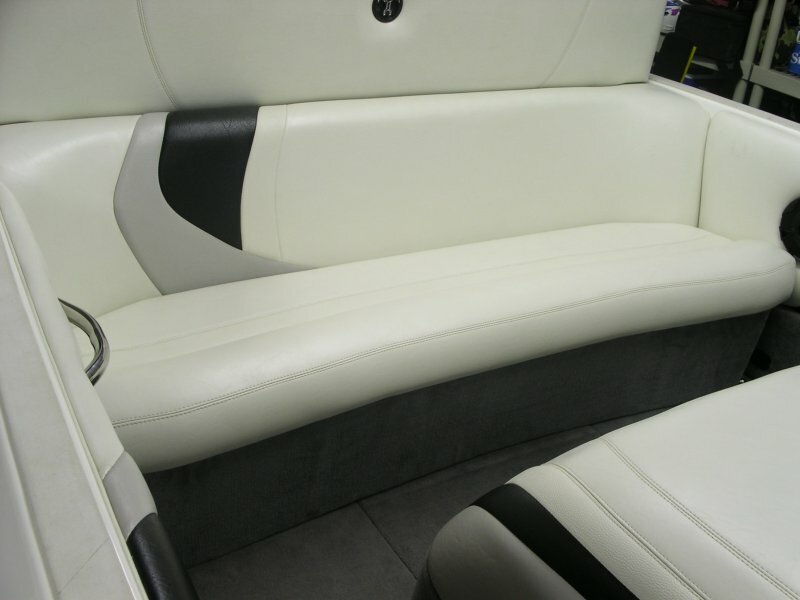 My back compartment is through the seat back, so making a different seat bottom may not work as nice as Tracie's. Still investigating this possibility. A custom 500 or more under the seat and smaller sac's on the side might work better. I am still debating if it is worth the effort. Sounds like a good plan, my only thought on that is whether or not you do any non-ballasted activities that would be impacted by the extra weight of the wood? The other thing is that if you build the boxes out of treated plywood that's glued, screwed & sealed, you'd have something that would allow more volume inside it. I am going to eventually put in a aluminum shelf above the gas tank in my sunsetter for the rear. That way it is hidden and when its empty, you still have the storage. You might also consider a few lead bars under the rear one piece seat bottom. Honestly, with a 750 (They claim) lb bag behind the motor and a 300 lb bag in the ski locker, with the pro wedge and 5-6 people, we have a great wake. The best though was with a 500 behind the engine, one on each side of the engine and two in the walkway, with no wedge....primo! Yea, if you can handle the lead and are not on a lake where you can get a lot of water in the boat it is much easier. I won't put any solid ballast in the boat just in case. We now will run the 2-550's on the sides of the engine, a locker sack, and the Wedge down. We may even have 6 people with this. The wake is nice. Some pick in the gallery. The thought of being able to have ballast available under the seat ~500, and then another 1100 along the engine, and the locker sac is appealing. If I can cover them and plumb them, that will make it much easier convenient to deal with when I have few or many people. I'm glad my new engine is strong. I want to get a new or almost new boat once we finish dealing with our house mess. Maybe next year. Another idea would be to have some aluminum tanks built to fit the spots & carpet them. They'd be light & make maximum useage of the space available. I don't think the CFO will go along with the cost of aluminum tanks. I was repremanded when I showed her Stewarts cup holders. I usually run one 700 behind the engine (in front of the seat), 4 tupperware containers under the seat filled with sand (about 80), a 550 locker sack that's probably filled to 450, and a walkway sac at 350 + the flat wedge on my 97 sunsetter. So that's a total of 780 rear and 800 front + wedge. I do this with up to 4 persons on board. The wake is pretty good. I have run it with 2 700's (one on each side of the engine) and my front setup as described above + the sand under the back seat. The monsoon was struggling a bit with 4 persons on board. The wake was pretty sick w/ wedge. Once I had about 12 people on board with the locker sack filled. The boat was kind of sluggish with the wedge down. Without the wedge the wake was real real nice. Less of a curbside edge and more of a smooth transition.